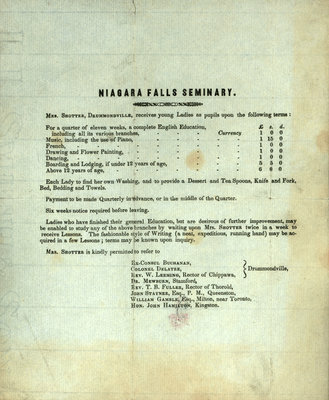 One broadside advertising the Niagara Falls Seminary [school for young Ladies], run by Mrs. Shotter of Drummondville, ca. 1840. The advertisement contains information about fees and courses, including a complete English education, music, French, drawing and flower painting, and dancing. The bottom of the page contains a list of references for Mrs. Shotter, including Ex-Consul Buchanan, Colonel Delatre, Rev. W. Leeming, Rector of Chippawa (all of Drummondville); Dr. Mewburn (Stamford); Rev. T.B. Fuller, Rector of Thorold; John Stayner, Esq., P.M. Queenston; William Gamble, Esq., Milton, near Toronto; and Hon. John Hamilton, Kingston. Drummondville (Niagara Falls, Ont.) -- History.